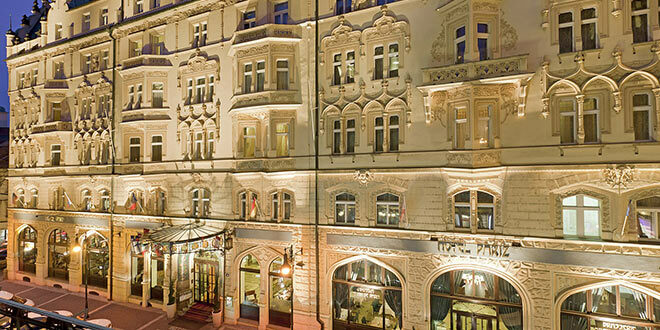 Stunning neo-Gothic building with art nouveau flourishes, this is Hotel Paříž. Major parts of the interior furnishing in the century-old traditional hotel have been preserved until today. 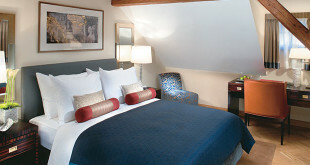 A spectacular, two-story suite was only installed a few years ago in the hotel’s tower. The suite offers an unparalleled programmatic view across the entire city. 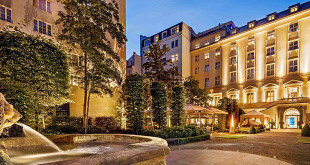 It’s indisputable that there is no other hotel in Prague that compares to the Hotel Paris, and so we can guarantee, you will enjoy your stay with us. 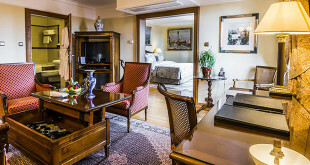 Our Hotel offers in total 86 luxury rooms including 9 Junior Suites and presidential apartment The Royal Tower Suite. Air-conditioned rooms are equipped with a direct dial phone with voice mail, Internet connection, remote control satellite TV, Pay TV, a mini bar, safe box, and a smoke detector. Luxury full-size bathrooms with separate air-condition and heated floors are equipped with hairdryer, massage shower, a bathrobe, a cosmetic mirror and cosmetic set. You are also cordially invited to our legendary Café de Paris a famous meeting point with a unique ambience, or to our gourmet Sarah Bernhardt Restaurant offering outstanding French and International cuisine. For relaxation there is our Wellness & Spa Centre with exotic Ayurveda Massages.